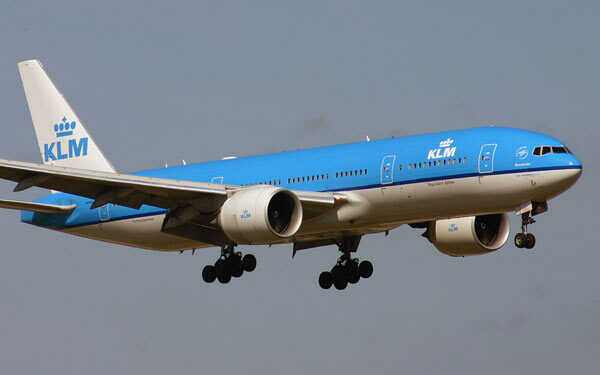 Boeing 777-200ER of KLM Royal Dutch Airlines. The Boeing 777 'Triple Seven' is the largest twin-engined airliner in the world and it is intended to fly medium to ultra-long distances with 300 to 400 passengers. In the late eighties Boeing identified a gap in its product range between the 767 and the 747. It needed a new airliner for high-density medium-range flights and for long-haul services for which the Boeing 747 was too big. The new airliner, which was developed a number of years later than its main competitors, the Airbus A330/A340 and the McDonnell Douglas MD-11, was also intended as a replacement for the McDonnell Douglas DC-10 and the Lockheed L-1011 TriStar. Initially the proposed airliner was to become a stretched and much improved version of the 767 (767-X), but finally Boeing decided to introduce an all-new aircraft with a wider cabin allowing nine-abreast seating in economy class. The 777-project was officially launched on 29 October 1980, two weeks after United Airlines placed the first order for 34 aircraft and took options on 34 more. Airlines and subcontractors were heavily involved in the design phase to define the requirements for the new aircraft. Boeing used the newest computer aided design technology (Dassault's CATIA system) to build a 'virtual airplane' first. Thanks to this system Boeing engineers could make sure that all parts of the aircraft fitted without building a traditional mock-up. The 777 became Boeing's first fly-by-wire airliner and the first Boeing jetliner with a circular cross section. The first flight was on 12 June 1994. United Airlines became the first user when it introduced the 777 on in 7 June 1995 on its Washington to London route. At its entry into service the 777 received ETOPS (Extended-range Twin-engined OPerationS) certification for 180 minutes, what means that it can fly up three hours flying time on one engine from the first diversion-airport in case of an engine failure. ETOPS operations require extra high reliability of systems, components and procedures. ETOPS certification is especially necessary for flying long overwater sectors. Boeing 777-200ER in the colours of Continental Airlines. Boeing developed several versions of the 777. The first was the 777-200, which was soon followed by an extended-range variant, the 777-200ER (initially designated as 777-200IGW - Increased Gross Weight). The 777-200ER made its maiden flight on 7 October 1996 and was introduced by British Airways in early 1997. The 777-200LR 'Worldliner' has an even longer range, the longest range of any airliner currently in operation. The Worldliner first flew on 8 March 2005 and the first example was delivered to PIA (Pakistan International Airlines) in February 2006. With the 777-200LR a world distance record for commercial aircraft was set in November 2005: 21,601 kilometers (14,438 nm). The aircraft was 22 hours and 43 minutes in the air and flew from Hongkong to London Heathrow in eastern direction. In May 2005 Boeing launched the 777F freighter version, after an order from Air France for five (plus three options). Boeing developed the cargo version from the 777-200LR and delivered the first freighters in early 2009. Boeing 777-300ER operated by Cathay Pacific. The 777-300 is a 10.13 m (33ft 3in) stretched version, primarily intended as a replacement for early generation Boeing 747 aircraft. It is even longer then the 747, but has a narrower fuselage. The 777-300 offers almost the same passenger capacity and range as the four-engined 747, but fuel burn is lower as are maintenance costs. The 777-300 can accommodate 368-451 passengers depending on cabin layout, but even high-density seating up to 550 passengers is possible. Compared with the 777-200 the -300 has a strengthened undercarriage, airframe construction and inboard wing. A tailskid was installed to prevent tail-strikes during take-off and landing, and ground manoeuvring cameras were mounted on the horizontal tail and underneath the forward fuselage to make taxiing easier for the pilots. Further changes were minimal to keep maximum commonality with the 777-200. The best-selling version of the Triple Seven is the 777-300ER (Extended Range), which combines the 777-300's longer fuselage with the 777-200LR's larger wing. This resulted in an aircraft with more seats and more range compared to the original 777-300. Boeing launched this version in the year 2000. On February 24, 2003, it made its first flight and it was certified by the FAA and EASA on March 16, 2004. Launch customer Air France took delivery of its first aircraft on April 29, 2004. In July 2014 Boeing delivered the 500th 777-300ER to Emirates. Until that time airlines had ordered more than 700 aircraft of this version. Many international airlines operate the twin-engined 777-300ER as a successor to the four-engined 747 Jumbo Jet. Its popularity was also stimulated by the fact that Airbus doesn't build a good competitor to the 777-300ER. The four-engined Airbus A340-600 was far less economical to operate than the 777-300ER with only two engines, and didn't please the airlines. Production of the A340 has stopped. Two future versions are the 777-8X and the 777-9X, which were officially launched at the Dubai Air Show in November 2013. The 777-8X is to become the successor of the 777-200ER. It will have a somewhat longer fuselage than the 200ER and carry 350 passengers over up to 17,222 km (10,702 nm). The 777-9X will be stretched a number of frames compared with the 777-300ER, seat more than 400 passengers and fly up to 15,185 km (9,436 nm). Both versions are expected to enter service in 2020. The new versions will get a new carbon fibre wing with a bigger span and tips that can be folded to match the aircraft with existing airport parking stands. Cabin windows will be larger and an important improvement will be the better cabin environment, thanks to higher air humidity and cabin pressure. The pressure will be comparable with that of the 787 Dreamliner, in which the air pressure is kept at that of 6,000 ft (1,800 m). That is more comfortable for passengers than the old industry standard of up to 8,000 ft (2,400 m). The first airline ordering the 777X is Lufthansa, with 34 of the 9X-version. Other early customers include Emirates, Etihad Airways, Qatar Airways and Cathay Pacific. In Spring 2014 Boeing had sold a total of more than 1700 777s of all versions, of which 1200 were delivered. A Boeing 777-200ER in the colours of El Al Israel Airlines.